Who's this cool customer? 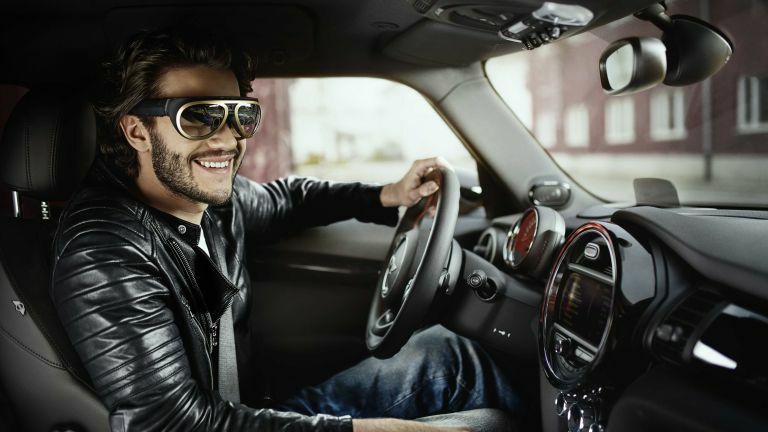 We've no idea, but he's wearing a pair of concept goggles made by Mini that use augmented reality to vastly improve the driving experience. Called Augmented Vision, they bring a load of extra info into the driver's line of sight. Don them, and you can see the speed, how much petrol is left and other stats without taking your eyes off the road. Obviously one of the main uses is as a satnav. Instead of squinting to see the instructions on a teeny dashboard-mounted screen, you'll have arrows beamed onto the real road ahead, like your own personal road signs. They're also useful out of the car. A mode called First Mile/Last Mile will point the driver in the direction of their car when on foot, so you'll never lose it in the multi-storey again. It will also be handy for finding a friend's house once you've parked up. Just remember to take them off before your friend answers the door. Augmented Parking feeds images to you from a camera housed in the farside mirror, so you won't have to crane your neck looking over your shoulder as you reverse in. Not only that, they also hook up to the in-car system, and will read out text messages and information on the music that's playing from your smartphone. They're just a concept at the moment, and will be on display at the Shanghai Motor Show next week. It's a nice idea, but we can't see people donning a special pair of glasses just for driving. Surely a smarter solution would be to beam the info on the windscreen. Having said that, car nuts love their accessories (who else would buy string-backed leather driving gloves?) so why not a pair of augmented reality specs? Mini will have to do something about the look though. As they are, even a stonewashed denim-clad petrolhead would balk at them.